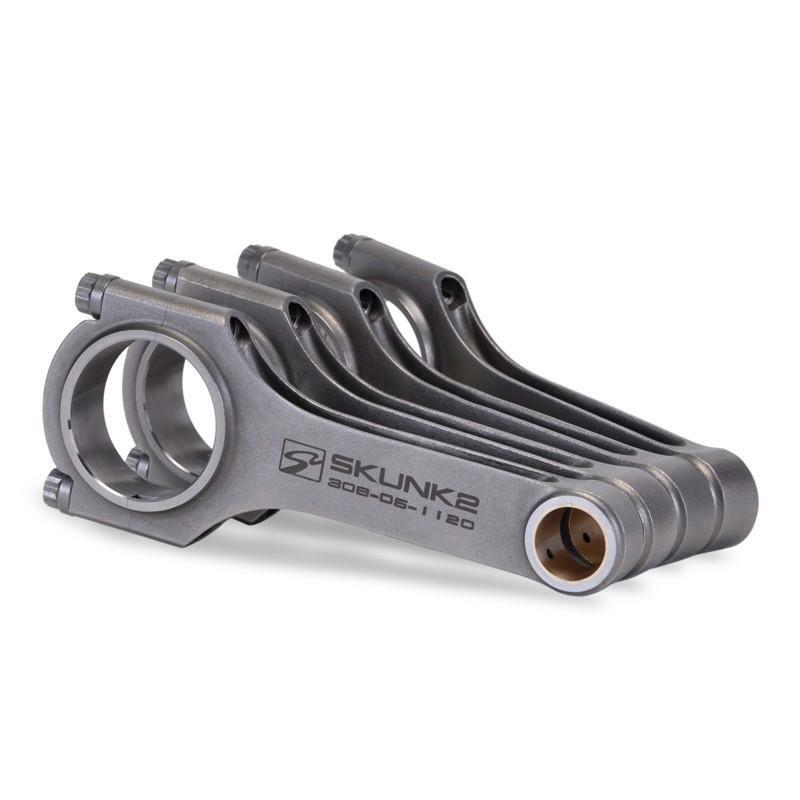 Skunk2 is proud to introduce its all-new Alpha Series Connecting Rods, available for most popular Honda and Acura applications. Alpha Series Rods are forged from select 4340 chromoly steel and feature a straight H-beam design, resulting in the ultimate strength-to-weight ratio. 4340 chromoly is one of the strongest materials available, however, not all 4340 chromoly is the same. As such, Skunk2 relies on extensive material testing and works closely with its foundry to produce high-quality rods at an affordable price. Comprehensive heat-treating, tempering, and shot-peening processes together ensure that each Alpha Series Rod remains consistent and strong. Finally, each rod is magna-fluxed to ensure integrity and that each process has been completed thoroughly and according to Skunk2’s rigid specifications. Skunk2’s engineers spent nearly three years developing and testing its straight H-beam rod design. The results are one of the strongest beam configurations available, capable of handling more than 900 hp. Engineers made use of FEA (Finite Element Analysis) to determine high-stress points and implemented features to reduce wear and increase strength. Skunk2’s straight design distributes stress across a larger area when compared to tapered rods, providing additional support where necessary. Alpha Series Rods are manufactured from two-piece forgings, resulting in optimal grain orientation along the rod cap for increased strength. By orienting the metal’s grain in the direction of stress along the rod cap, perpendicular to the stress exerted along the beam, strength is significantly increased. Skunk2’s two-piece forgings provide a precision-tight fit between the rod’s cap and its beam without resorting to the brittle materials required by other processes. Alpha Series Rods also feature dual oil passages at their pin ends, providing additional lubrication and cooling, which leads to an even stronger, more durable rod. Unlike other designs, Skunk2’s carefully positioned, offset oil passages help deliver lubrication around the entire wrist pin, during each phase of the engine cycle. Connecting rod bolts endure more stress than any other engine fastener. Each Alpha Series Rod features high-quality, Skunk2-branded, 3/8-inch ARP2000 bolts. ARP2000 rod bolts are forged, heat-treated, precision-machined, and capable of clamping loads as high as 220,000 psi. Precision-machined, bronze wrist pin bushings are also fitted to each Alpha Series Rod for increased wear resistance, and are compatible with most aftermarket pistons without additional machining. Not all forged H-beam rods are the same. Only Skunk2’s Alpha Series Rods feature our unique design, precision machining, and are capable of handling more than 900 hp, all at an economical price.